Smooth and gentle to use, make these premium Systane Lid Wipes part of your daily cleaning routine. These handy eye care wipes are ideal for maintaining the hygiene of even the most sensitive of eyes. 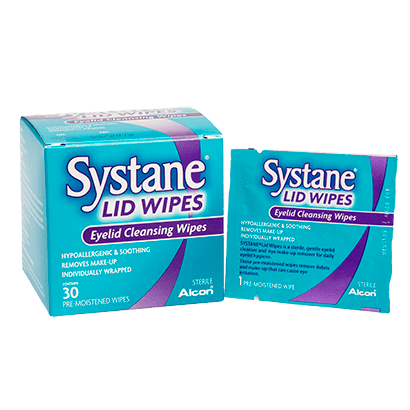 Developed by eye care professional Alcon & Ciba Vision, Systane Lid Wipes are designed to use on eyelids and the surrounding areas to get rid of any dirt, bacteria or make-up around your eyes. Keeping your eyes safe from irritation and possible infection, the hypoallergenic wipes are perfect for daily use, with each box containing 30 individual wipes wrapped to ensure ultimate sterility and cleanliness. Each Systane Lid Wipe is pre-moistened, offering a refreshing and soothing clean of each eyelid and can even be used when you have your contact lenses in. For use, simply sweep the cleansing wipe gently across closed eyelids several times. Maintain total hygiene with our extensive range of Systane products at FeelGoodContacts.com. For any questions, please don’t hesitate to contact our dedicated customer service team for any assistance.